Team Practices from May 1st to September 20th on every Tuesday and Thursday from 5:00 PM to 9:00 PM. No Practices from July 22nd to August 4th. $3 with UCI or FQSC license. $5 extra for event license. Opened to all BMX and Mountain Bikes. All races are opened to all levels from 5 years of age to adult. 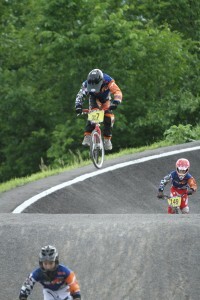 BMX with 20 inch wheels, Cruiser (24 inch wheels) and Mountain Bikes. All riders must have Full Face Helmet, gloves, long sleeve jersey and long pants with knee pads. Elbow pads strongly recommended. Our track is made of dirt with a fine gravel layer. All berms are covered with asphalt. Track has great flow, 250m long.